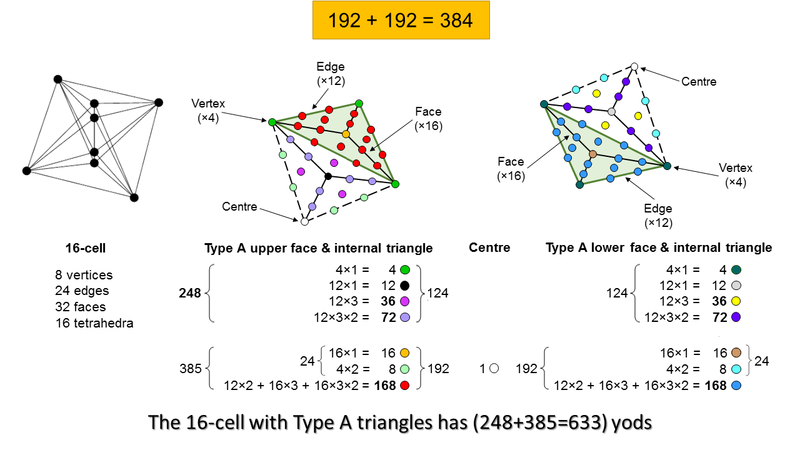 Given that our discussion of the three polygons analogous to the Supernal Triad has revealed the 16-cell to be — in that context —the most fundamental of the six polychorons because the 24-cell encoded in the three polygons is a compound of three 16-cells, it is worthwhile to analyse its properties here in order to uncover evidence of its holistic character. This will manifest by the appearance of the gematria number values of the 10 Sephiroth in the four Kabbalistic Worlds quantifying its properties and by its displaying structural parameters of sacred geometries established elsewhere in this website. These numbers are listed in Table 3 in #2. 16 tetrahedra (cells, or 3-polytopes); 4 meet at each edge. It would be incorrect to regard the 32 faces of the 16-cell as corresponding to the 32 yods above Chesed because one would, intuitively, expect the degree of complexity of polytopes in the 16-cell to increase with the downward descent from Kether towards Malkuth of the yods that symbolise them, but this correspondence disrupts the order by placing 2-polytopes before 1-polytopes, instead of the more natural progression: 0-polytopes→1-polytopes→2-polytopes→3-polytopes, which has been followed in the diagram above. The 4 yods in the root edge of the 7 enfolded polygons correspond to any two opposite vertices and the two sides of internal triangles that form an axis of the 16-cell (see (6) below). The 260 (=26×10) yods outside the root edge correspond to the 260 corners & sides outside this axis: 260 = 62 corners + 198 sides = 6 vertices + 56 corners + 24 edges + 174 sides. This is how YAHWEH with number value 26 prescribes the 16-cell. Just as the 264 yods in the 7 enfolded polygons show the factorisation: 264 = 3×88 as 2×88 (hexagonal yods) + 88 (corners & centres of tetractyses), so, too, the 264 corners & sides of the 16-cell comprise the 88 sides in each half that are not edges and the 88 corners & edges of the whole polychoron. Isomorphism exists between the inner Tree of Life and the 16-cell because the latter is the 4-dimensional manifestation of the former. is the sum of the first ten odd integers after 1, showing how the Decad (and EHYEH with number value 21) determines the number of hexagonal yods needed to construct the 16-cell from tetractyses. 336 of the 632 yods surrounding the centre of the 16-cell with Type A triangles are hexagonal yods in its faces, leaving 296 yods (148 in each half) that are either corners or internal hexagonal yods. 148 is the number value of Netzach. Here is a conjunction of four numbers associated with the same Sephirah (Netzach). (96+16=112) points, lines, triangles & tetrahedra surround its centre, where 112 is the number value of Beni Elohim, the Order of Angels assigned to Hod. The 16-cell has 48 faces (2-polytopes) & tetrahedral cells (3-polytopes), where 48 is the number value of Kokab, the Mundane Chakra of Hod. 3) 280 yods line the 96 tetractyses in its 32 faces. This is the number value of Sandalphon, the Archangel of Malkuth. Here is a second, remarkable, chance-defying conjunction in the same context of the gematria number values of the Godname (65), Archangel (280) & Mundane Chakra (168) of the same Sephirah (Malkuth). 140 yods line the 48 tetractyses making up the 16 faces in each half of the 16-cell, where 140 is the number value of Masloth, the Mundane Chakra of Chokmah. 376 yods make up its faces (188 in each half). 187 yods in the 16 faces in each half surround its axis, where 187 is the number value of Auphanim, the Order of Angels assigned to Chokmah. As (1) shows that the 16-cell embodies the number 248 of Raziel and the number 26 of YAHWEH and as (4) shows that it embodies the number 73 of Chokmah, here is a conjunction of all 5 numbers associated with the same Sephirah. 5) When its faces and interior triangles are simple triangles, there are (8+24=32) corners & sides of triangles in its faces and (1+8=9) internal corners & sides, a total of 41 corners & sides. This is both the 21st odd integer and the 15th prime number, showing how EHYEH, the Godname of Kether with number value 21 and YAH, the shortened Godname of Chokmah with number value 15, prescribe the minimal geometry of the 16-cell. Collecting together results discussed in (1), (3) & (4), all 6 numbers associated with the Sephirah Chokmah are now seen to be naturally embodied in the 16-cell. 6) If we consider an axis passing through two opposite vertices and its centre, it is composed of 3 corners and two sides of triangles. Therefore, (41−3−2=36) corners & sides surround it. This is the number value of ELOHA, the Godname of Geburah. 632 yods surround the centre of the 16-cell. This means that, given its centre and two "poles" (a pair of vertices at ±1 on the axis), 630 yods are needed to construct its 168 tetractyses. 630 is the number value of Seraphim, the Order of Angels assigned to Geburah. The 97 points, lines & triangles include two lines forming this axis. The 16-cell contains 95 points, lines & triangles other than these two axial lines, where 95 is the number value of Madim, the Mundane Chakra of Geburah. Surrounding the centre of the 16-cell with Type A triangles are 264 corners & sides, i.e., 262 geometrical elements other than these two lines. Each half has 131 such geometrical elements. This is the number value of Samael, the Archangel of Geburah. The 16-cell embodies all five number values associated with Geburah. signify in the present context the 384 rotations+reflections of the 4-cube and 16-cell, the 48 rotations+reflections of their 3-dimensional counterparts — the cube and the octahedron, the 192 proper rotations* of the 4-cube and 16-cell and the 24 proper rotations of the cube and octahedron. 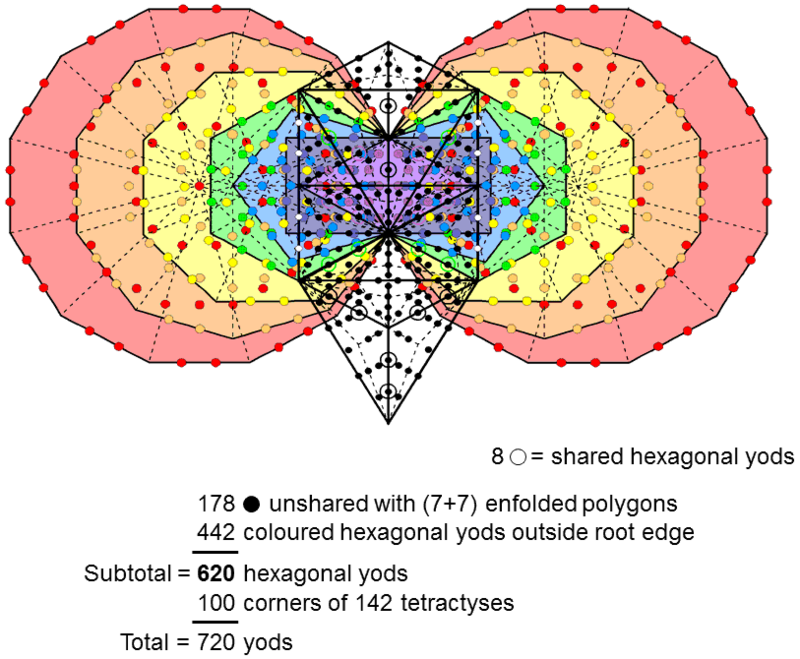 The appearance of the holistic parameters 384 & 192 as orders of the hyperoctahedral group for 4-polytopes does not mean that all sacred geometries that embody these numbers depict only the symmetries of 4-dimensional objects. For example, the 5 Platonic solids embody them (see here), as do the 7 separate polygons making up the inner form of the Tree of Life (see here). What it does mean is that such objects, in which these numbers uniquely appear, are holistic in character, exhibiting the complete pattern of the Whole, even though they may be only components of it. The Whole is reproduced in its parts. When its 10 sectors are constructed from 2nd-order tetractyses, the decagon contains 620 hexagonal yods (310 hexagonal yods in each 5-fold array of sectors). The 1st 10 regular polygons have 75 sectors. One corner, two sides & a triangle are associated with each sector, i.e., 4 geometrical elements. Including their centres, the 1st 10 separate polygons are composed of (75×4 + 10 = 310) geometrical elements. The 1st (10+10) separate polygons comprise (310+310=620) geometrical elements. When its 16 triangles are Type A, the Tree of Life contains 214 yods. 26 yods are corners and 188 are hexagonal yods. The two hexagonal yods on the Geburah-Chesed Path coincide with the centres of the two triangles in the inner Tree of Life. 4 hexagonal yods on each side pillar are shared with it. (188−2−4−4=178) hexagonal yods are unshared with the inner Tree of Life, which has 444 hexagonal yods (442 outside the root edge, which has two hexagonal yods). The number of hexagonal yods outside the root edge in the combined Trees of Life = 178 + 442 = 620. A Type B N-gon has (15N+1) yods that comprise (2N+1) corners & 13N hexagonal yods. The number of hexagonal yods in the 7 Type B polygons with 48 corners = ∑13N = 13×48 = 624. This is the number of yods needed to construct the 16-cell from Type A triangles, starting with its 8 vertices. 11) The 16-cell has 568 hexagonal yods. Four of them line the axis, so that (568−4=564) hexagonal yods surround it. 282 such yods in each half of the 16-cell surround its axis. The number value of Aralim, the Order of Angels assigned to Binah, is 282. Surrounding its centre are 464 yods lining sides of 168 tetractyses. Six yods apart from the centre lie on the axis. (464−6=458) boundary yods surround the axis, 229 such yods in each half. 229 is the 50th prime number, showing how ELOHIM, the Godname of Binah with number value 50, prescribes the number of yods needed to shape the faces and interior of the 16-cell constructed from Type A triangles. 632 yods surround the centre of the 16-cell, 316 yods being in each half. Including the centre, which is shared by both halves, there are 317 yods in each half. 317 is the number value of Shabathai, the Mundane Chakra of Binah. Excluding the two hexagonal yods on each half of the axis and the 4 vertices in each half of the 16-cell, there are (317−2−4=311) yods in each half sharing the centre. 311 is the number value of Tzaphkiel, the Archangel of Binah. The axis has one corner and two sides inside the 16-cell. When they are simple triangles, the 32 faces comprise 32 corners & sides. The faces & axis comprise 9 corners, 26 sides & 32 triangles, i.e., 67 geometrical elements, where 67 is the number value of Binah. The 16-cell embodies all 5 number values associated with this Sephirah. The same 36:48 division of the holistic parameter 84 appears in the 84 repetitions of Pythagorean intervals** between the notes of the 7 diatonic musical scales making up the 8 Church Modes. The 4 Authentic Modes have 48 repetitions of Pythagorean intervals between their notes, whilst the 3 Plagal Modes have 36 repetitions of Pythagorean intervals between their notes (for proof, see the fourth comment under the table of intervals here). One half of the 16-cell with 84 triangles is analogous to the 84 repetitions of rising, Pythagorean intervals; its opposite half with 84 triangles corresponds to the 84 repetitions of falling, Pythagorean intervals (N.B. if a rising interval has a tone ratio of N (N>1), its falling counterpart has a tone ratio of 1/N). The 48 triangles making up the 16 faces in each half of the 16-cell are analogous to the 48 repetitions of Pythagorean intervals between the notes of the 4 Authentic Modes, whilst the 36 triangles inside each half of the 16-cell correspond to the 36 repetitions of Pythagorean intervals (rising or falling) between the notes of the 3 Plagal Modes. The distinction between the exterior and interior of the 16-cell is what corresponds to the difference between the 4 Authentic Modes and the 3 Plagal Modes in the 7 diatonic scales. The 84 sectors in each half of the 16-cell has their counterpart in the UPA/superstring. Each of its 10 whorls is a helix with 1680 circular turns. The helix winds 5 times around its axis of spin, so that every half-revolution comprises 168 turns (84 per quarter-revolution). The rotating 16-cell. Each half has 28 triangles with 84 sectors. 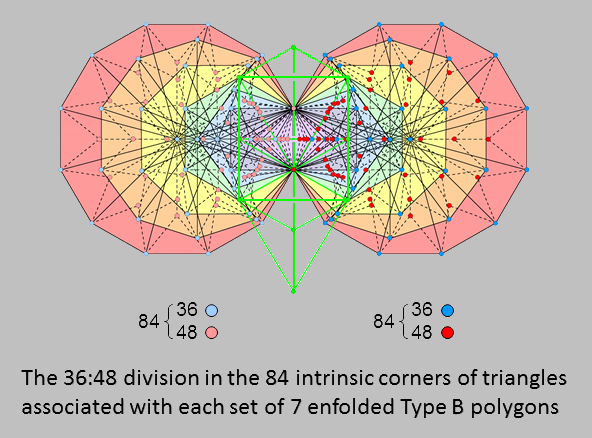 The 7 enfolded Type A polygons have 176 corners, sides & triangular sectors (see Table 3 here). Their shared root edge is a side with a corner at each end, i.e., it is composed of 3 geometrical elements, so that (176−3=173) geometrical elements are outside the root edge. The centres of the hexagon and decagon are also corners of, respectively, the triangle and the pentagon. Therefore, 5 centres (shown as black dots in the picture above) are not corners of polygons. They are surrounded by (173−5=168) geometrical elements outside the root edge. The centre of a Type A n-gon divided into its n sectors is surrounded by 4n geometrical elements. The separate Type A triangle, square, pentagon & dodecagon with 24 corners have (4×24=96) geometrical elements surround their centres. 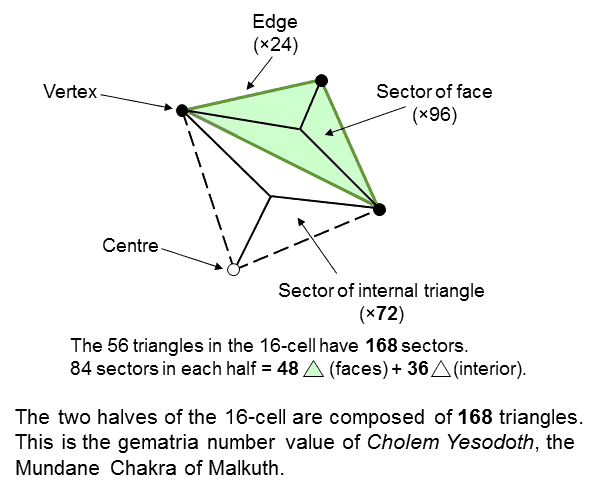 Enfolded, they have (96 − 3×3 = 87) such geometrical elements, i.e., (87−3=84) geometrical elements surrounding centres of polygons are outside the root edge, where 87 is the number value of Levanah, the Mundane Chakra of Yesod. The hexagon, octagon & decagon with 24 corners have (168−84=84) geometrical elements outside the root edge that surround their centres. The remaining 48 corners consist of the corners at the centres of the 47 sectors and one of the two endpoints of the root edge; they are coloured either dark red or light red. The 36 light or dark blue corners correspond to the 36 triangles making up the 12 Type A triangles inside each half of the 16-cell, whilst the 48 dark red or light red corners correspond to the 48 triangles making up the 16 faces in each half when they are Type A triangles. 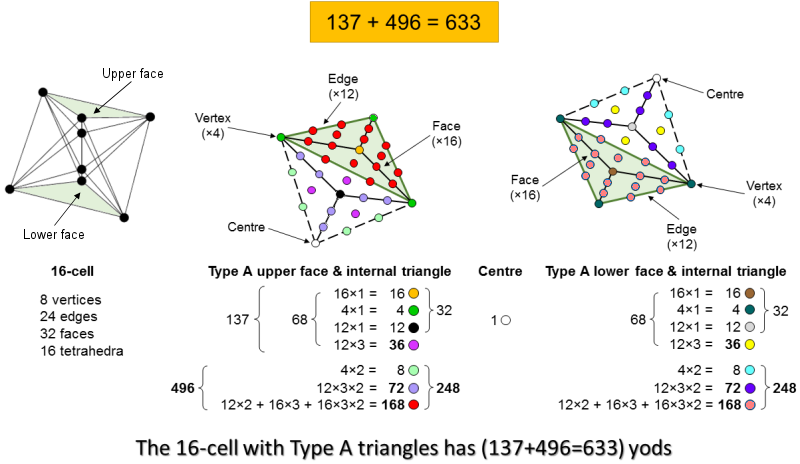 We find that the 84 triangles making up each half of the 16-cell are the counterpart of these 84:84 divisions exhibited by the two halves of the inner Tree of Life. 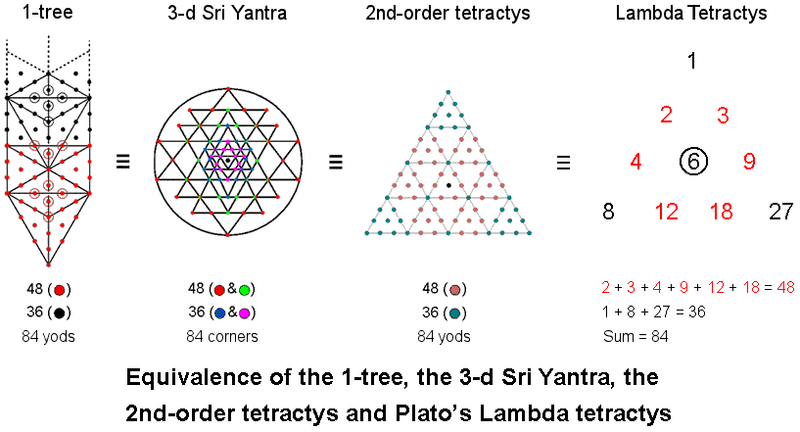 Furthermore, each set of 84 triangles displays the 36:48 division that is characteristic of this holistic parameter, as illustrated above for various sacred geometries, including the inner Tree of Life. It is evidence that the 16-cell is the polychoron version of the archetypal structure of a holistic system. The upper half has 16 faces with 4 green vertices. Its 16 triangular faces have orange centres. Its 12 internal Type A triangles has black centres, 3 violet hexagonal yods at the centres of the sectors of each one and 6 dark grey hexagonal yods lining their sides. The lower half has 16 faces with 4 dark green vertices and a brown yod at the centre of each face. Its internal Type A triangles have light grey centres, 3 yellow hexagonal yods at the centres of their sectors and 6 mauve hexagonal lining their sides. Each half has (3×12 + 3×16 = 84) tetractyses with 32 corners and 36 internal hexagonal yods (violet/yellow). 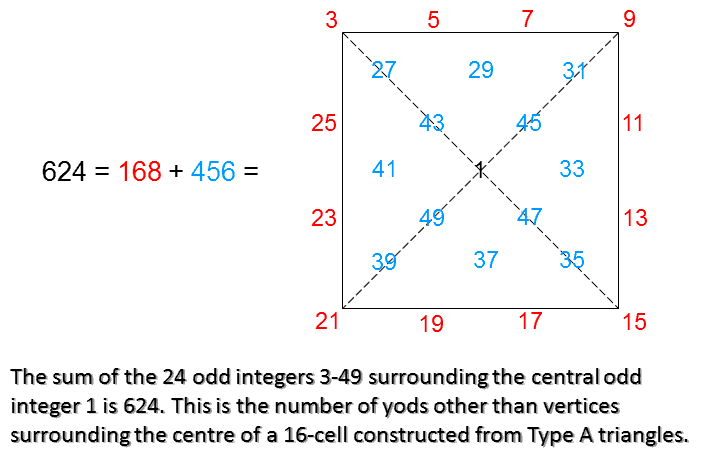 Together with the centre of the 16-cell, there are [1 + 2(32+36) = 137] yods that are either corners (65) or hexagonal yods (72) at the centres of internal tetractyses. 168 hexagonal yods lining 60 sides of 48 tetractyses or at their centres in the 16 faces → 168 roots of E8 that are not roots of E6. The hexagonal yod composition of the 16-cell is isomorphic to the 8:72:168 root composition of each E8 in E8×E8, each half of the 16-cell containing 248 yods that correspond to the 248 roots in E8. This is amazing but not unexpected, for the 16-cell is, after all, a holistic object, so that it must display all the parameters that characterise such objects, one of which is the number 496, whose origin is still so mysterious to superstring physics. Here we find it embodied in the 16-cell, along with the equally enigmatic number 137, whose reciprocal physicists have long known is approximately equal to the fine-structure constant, as discussed earlier. Their mystery vanishes once it is understood that they belong to a class of numbers that parameterise those geometrical objects (or, more generally, holistic systems) that embody the divine archetypes, such as certain sacred geometries of the world's religions. The numbers 137 and 496 appear in atomic and particle physics because they are signatures of holistic systems. The problem of their appearance there exists only for the philosophy known as "scientism." This refuses to countenance the possibility of the transcendental as the ultimate source and cause of all things, and it has no room for the notion of "holistic" as it confuses what it deems irrational with what is beyond the bounds of science because it is supra-rational and the divine source of all rationality. We find that the classes of yods in the 16-cell naturally make up a set of 384 yods (192 yods in each half) whose distribution in 4-dimensional space conforms to the archetypal pattern of division of a holistic system (see here). We also find that the remaining 248 yods naturally divide into a set of 8 yods corresponding to the 8 simple roots of E8, a set of 72 hexagonal yods corresponding to the 72 roots of E6 and a set of 168 yods corresponding to the remaining 168 roots of E8. There are too many correspondences to be attributable to chance. Its embodiment of the dimension 248 of E8, the dimension 496 of E8×E8 and the 192:192 pattern governing holistic systems found in sacred geometries amounts to convincing evidence for the holistic character of the 16-cell. * Proper rotations are pure rotations about an axis unaccompanied by reflections. Improper rotations are rotations about an axis followed by reflection in a mirror perpendicular to that axis. For more details, see here. ** "Pythagorean intervals" are intervals that are also tone ratios of the 6 notes between the tonic and octave of the Pythagorean scale.